The new mosaic at HCLS Elkridge Branch was unveiled on October 20, 2018 with the help of children from the branch and Howard County Executive Allan Kittleman (second from left), County Councilman Jon Weinstein (left) and HCLS President and CEO Tonya Kennon (right). The mosaic was created by internationally acclaimed and award-winning artist Yulia Hanansen who was chosen for her thoughtful approach to the project. 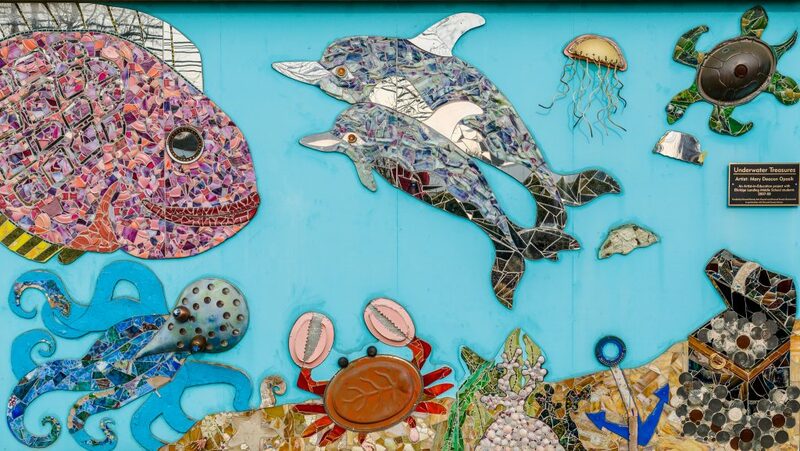 Ms. Hanansen, who lives in the Baltimore area, designed a colorful mosaic which incorporates elements from the previous mosaic and fits into the branch’s marine theme. The new mosaic is located in the outdoor patio adjacent to the children’s area. As plans for construction began to get underway for the new HCLS Elkridge Branch + DIY Center, HCLS attempted to preserve the charming mosaic (shown below) once located on an exterior wall of the old building. This original mosaic was constructed in 2007-08 as part of a community art project with Elkridge Landing Middle School, Howard County Government, the Howard County Public School System, and Howard County Arts Council. The community contributed materials, and art students from the middle school worked with art teacher Patti Battalglia (deceased) and Mary Opasik, an artist from the Arts Council, to produce three panels. Prior to construction of the new branch building, the original mosaic art mural was moved to a temporary facility. Proposals were solicited from artists to refresh or refurbish the community project. Unfortunately, due to long-term outdoor exposure to and the resulting effects of weather and pollution from heavy traffic along the adjacent Route One highway, the mosaic could not be salvaged. Once this was realized HCLS began a search for an artist who could create a new mosaic inspired by the original.